When you’re behind the wheel, surely you like to think that you’re well aware of your surroundings. You constantly check your rearview and side view for other vehicles, especially before changing lanes or merging. Furthermore, provided that you’re not driving through a heavy rainstorm or in thick fog conditions, you can always easily see the cars that are in front of you so as to maintain a safe driving distance behind them. However, even the most cautious of drivers can still fall victim to the infamous blind spot–that mysterious spot on both sides towards the rear of the vehicle where it’s nearly impossible to see. These spots can be extremely dangerous and often lead to car accidents when a driver doesn’t realize there’s a car in his blind spot and attempts to merge or change lanes. The results can be catastrophic, especially at highway speeds. In fact, the National Highway Traffic Safety Administration reports that more than 800,000 accidents and 300 fatalities occur every year as a result of poor blind-spot visibility. Unfortunately, even though vehicle design has vastly improved over the years and car manufacturers have made an effort to reduce the occurrence of blind spots, they’re essentially impossible to avoid in many car makes and models. Of course, drivers should always exercise additional precautions when changing lanes and merging; this includes not only checking one’s side and rearview mirrors for other cars, but momentarily turning around in one’s seat to check blind spots as well. Still, this isn’t a fail-proof method. Fortunately, however, many car manufacturers these days have begun to implement technologies that alert vehicles of cars in their blind spots and even let them know when it’s safe to change lanes based on a series of sensors, radars, and/or cameras. These days, these are essentially two types of blind-spot monitoring systems on the market. 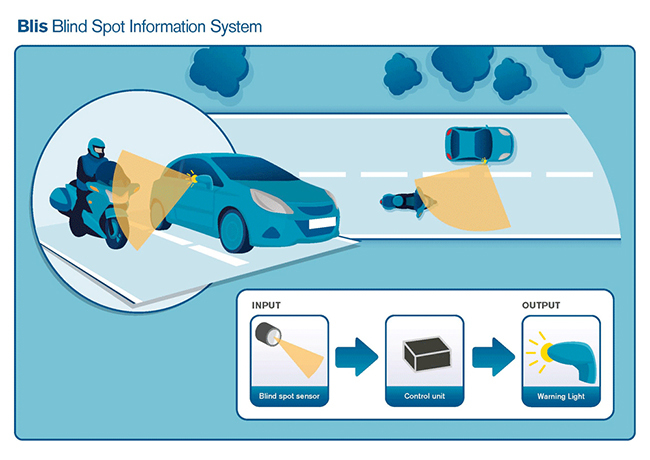 Active blind spot monitoring systems use technology, such as radio waves and/or digital cameras to detect vehicles in or near a car’s blind spot. Passive blind spot monitoring systems, on the other hand, use a more “old-school” method of simply installing a convex mirror on either side view mirror. Read on to learn more about what today’s auto makers are doing to cut down on accidents related to blind spots. There are numerous types of active blind spot monitoring that have been added to today’s most innovative car makes and models. Typically, active monitoring systems utilize a detection device located on either side of the car. This device emits electromagnetic waves to detect the presence of other objects near a car’s blind spot. When wavelengths of electromagnetic frequencies bounce back to the emitter, the car can calculate how close the other vehicle is and will alert the driver if it’s too close or in the vehicle’s blind spot. Typically, the system alerts the driver by flashing a light on either a rearview mirror or on a side mirror so that it’s in plain sight. Some vehicles use a combination of wavelengths and images captured from an on-board camera to detect vehicles in blind spots as well. Ford: These days, many Ford vehicles come with a Blind Spot Information System (BLIS) that utilize the electromagnetic waves described above to alert drivers to the presence of vehicles in their blind spots. The warning light that comes on can be found on the side view mirror itself. Volvo: This car manufacturer uses a similar technology to Ford’s, with the main difference being the manner in which the car alerts drivers. On most Volvos, an LED light will illuminate on the edge of the windshield near the turn signal instead of on the mirror itself. Audi: This German car manufacturer has come up with its own version of the BLIS, known as the Audi Side Assist. Their claim to fame is that the Audi Side Assist can detect approaching vehicles as far as 150 feet away. The system notifies drivers by illuminating a light in the external side view mirror as well. Infiniti: This car company is doing things a little differently by implementing two different blind spot monitoring systems. One includes the standard BLIS system (which they refer to as a Blind-Spot Warning system), and one is called a Blind Spot Intervention system (BSI). This system can actually steer a car drifting into an occupied lane back to safety. Although it can be overridden, it’s probably not in any driver’s best interests to do so. Furthermore, Infiniti models go above and beyond to alert drivers of blind spot occupancy with not only a light but an audible ding as well. Only time will tell whether other vehicle manufacturers will begin picking up this technology or not. Of course, not all car manufacturers are implementing active monitoring on every vehicle. After all, these technologies are still relatively new. Not to mention, they drive up the cost of the vehicle. To keep costs down while still improving blind spot visibility, then, some car makers are installing convex mirrors in addition to the traditional side view car mirrors. These convex mirrors provide a greater range of vision for drivers and thus allow them to see most (if not all) of their blind spots without having to turn around in their seats. In fact, it has been found that these less expensive monitoring systems are just as effective as the fancier, active systems found in other cars. Furthermore, many drivers actually prefer this simple monitoring system over the more complex ones. The main reason for this is that some drivers get annoyed by the lights and noise alerts that come along with most BLIS systems, many of which cannot be silenced or disabled. Because of the high price tag that typically comes along with cars that have built-in active monitoring systems, passive systems may be a better option for those who are looking to save money. After all, any car can be retro-fitted with a mirror, but generally only luxury and higher end cars come with active monitoring systems built in. Those with cars that don’t have a convex mirror can probably purchase one for a few bucks at a local auto supply store. However, self-installation isn’t encouraged, as the precise alignment of the mirror is vital in its effectiveness. Instead, it’s best to have a professional install the mirror. Vehicle design has come a long way, especially in terms of dealing with blind spots. Does your car have any systems in place to make you more aware of your blind spots while behind the wheel? If not, then it may be time to consider upgrading or purchasing your own passive monitoring device. After all, doing so could mean the difference between getting into an accident and staying safe while on the road. Learn more about driver safety and defensive driving techniques by taking an online traffic school course!